The departure of Jill Abramson marked an abrupt end to the reign of the first woman to run The New York Times, a role that made her a journalistic pioneer in her own right. Her dismissal comes during the same week as the retirement of Barbara Walters, who broke a glass ceiling at ABC in 1976 by becoming the first woman to sit at a network anchor desk. Both events have prompted a debate about the role of women in American journalism and how much—or how little—has changed over the years. Our data analysis finds that overall there has been little significant change in the share of women newsroom employees and news managers in recent years. Female journalists are generally paid less than their male counterparts, an issue that may have played a role in Abramson’s exit, according to some media accounts, although the New York Times has denied that. 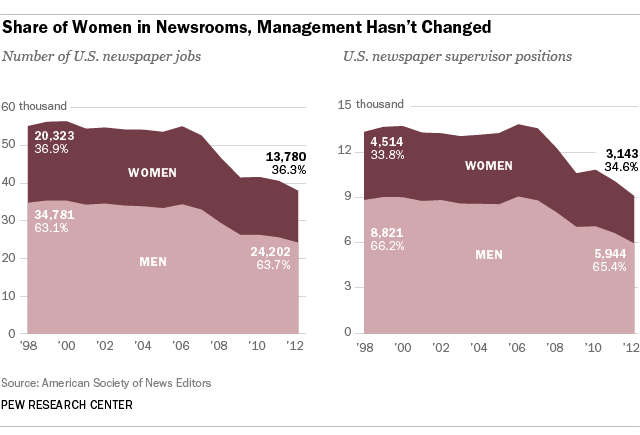 In the past 15 years, the percentage of women who work in newspaper newsrooms has barely budged. Women made up 36% of all newspaper staff in 2012 (the last year for which data are available), nearly unchanged from 37% in 1998, according to The American Society of News Editors’ annual census. Virtually the same proportion of women (35%) worked in supervisory positions in newspapers in 2012, a number that has also barely changed since 1998, when it was at 34%. (At the Times itself, four of the top nine editors currently are women, even after Abramson’s departure.) It’s worth noting that these shares have remained the same during a period when newspaper newsrooms have been shrinking. Since 1998, nearly 17,000 of those jobs have been lost, according to ASNE. An accounting of newspaper salaries by gender comes from a recent Indiana University survey of 1,080 U.S. journalists that found the median income for women employed at newspapers in 2012 was about $5,000 less than for men: $42,857 for women compared with $48,037 for men. In other words, women typically earned 87% of what men did. For all journalism jobs, the Indiana research shows that the median income for women was $44,342 in 2012 or 83% of what a male journalist brought home ($53,600). This pay gap has barely changed in the last two decades—it was 81% in 2001 and 1991. 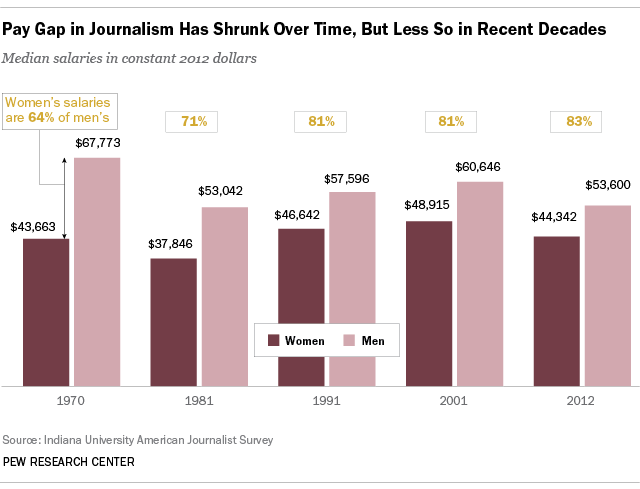 The numbers do represent something of an improvement from 1970 when women only made 64% of a male journalist’s median salary, or from 1981 when women earned 71 cents for every dollar paid to men. A Pew Research Center analysis of data from the U.S. Bureau of Labor Statistics found that median hourly earnings for all women in 2012 amount to 84% of what a man makes, which is on par with Indiana’s findings for journalists. In the broadcast journalism business, women also lag behind as a percentage of the overall workforce and even more so in management roles. Women accounted for 40% of the total workforce in local television news in 2012, the last year for which numbers are available, according to survey data from the Radio Television Digital News Association and Hofstra University. That compares with 39% in 2003. In addition, only 18% of local TV general managers and 29% of local TV directors in 2012 were women. That represents a modest rise from a decade earlier (2003), when women filled 12% of general manager positions and 25% of news director slots. In radio news, there has been an increase in the number of women in the overall workforce. But the trajectory isn’t as positive when it comes to management positions. The percentage of women working in local radio news grew from 22% in 2003 to 34% in 2012, according to RTDNA. During this period, however, the percentage of female general managers remained virtually flat, inching up from 13% to 14%. (The percentage of female GM’s peaked at 25% in 2007 and has steadily declined since then.) The number of women working as local radio news directors has also dropped—from 26% in 2003 to 21% in 2012.